Redwine was responsible for processing paper and born-digital collections, developing policies and procedures for the Ransom Center\'s born-digital preservation program, and maintaining Encoded Archival Description versions of the Center\'s finding aids. 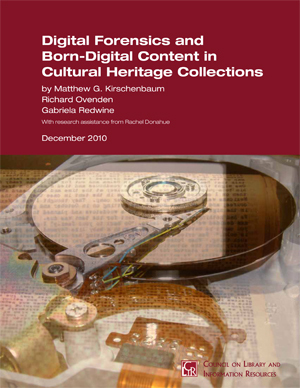 Computer storage media have begun to arrive in archival collections with increasing frequency over the last 20 years. Approximately 50 of the Ransom Center’s holdings contain floppy disks, CDs, or personal computers. Faced with the daunting task of capturing files from these media and making them available to researchers, archivists have begun to investigate fields such as computer science, engineering, and computer forensics for advances that may facilitate this work. The Ransom Center recently participated in a Mellon-funded project, led by Matthew Kirschenbaum at the University of Maryland, designed to explore the convergences between computer forensics and the preservation of born-digital cultural heritage materials. Ransom Center archivist Gabriela Redwine and Richard Ovenden, associate director and keeper of special collections at the Bodleian Libraries, served as collaborators on the project, which the Library of Congress named one of the “Top 10 Digital Preservation Developments of 2010.” The resulting report, Digital Forensics and Born-Digital Content in Cultural Heritage Collections, was recently published by the Council on Library and Information Resources (CLIR). In 2011, the Society of American Archivists recognized the report with a Preservation Publication Award Special Commendation. Digital Forensics is the first publication of this length to present computer forensics to the archives and library communities. Building on the pioneering work of Jeremy Leighton John at the British Library, the report examines the relevance of forensic techniques and methodologies to archivists, curators, and others engaged in the collection and preservation of born-digital cultural heritage materials. The report considers challenges related to legacy formats, the authenticity of files, and data recovery; explores the ethical implications of implementing forensic techniques as part of an archival workflow; and concludes with recommendations and next steps. Side bars by an international group of practitioners and scholars cover topics such as diplomatics and donor agreements, offer a sample forensic workflow, provide case studies from the Bodleian and Stanford libraries, and describe “Rosetta” machines of particular use in capturing born-digital materials. Detailed appendices provide contact, pricing, and specifications information for open source and commercial forensics hardware and software. The authors solicited feedback about an earlier draft of the report at a May 2010 symposium organized around the same topic, which brought together practitioners from archives and libraries, scholars from the humanities and computer science, and computer forensic experts from government and industry. The Ransom Center seeks donated computer equipment to help in its digital preservation, access, and outreach efforts. Photo by Anthony Maddaloni. Since the early 1990s, the Ransom Center has been receiving computers, disks, and similar media as part of its manuscript collections. One of the biggest challenges we face when trying to preserve these materials is accessing files that are on older disks. Some of the items in our collection, such as CDs and DVDs, were created relatively recently and can be read using modern computers. But, to access older types of media—for example, 8-inch and 5.25-inch floppy disks or 3-inch Amstrad disks—we must first find the correct drive or computer. The Center’s collection includes close to 2,300 disks, as well as personal computers from Michael Joyce, Iain Sinclair, and other authors. Approximately 60 percent of these disks are 3.5-inch floppies of various types (single- or double-sided, double density, high density, etc.). Recent acquisitions have also included older formats such as 5.25-inch floppy disks and TRS-80 computer cassette tapes. 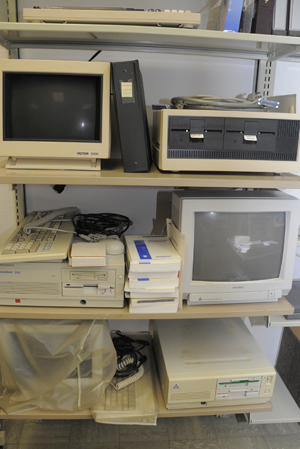 Thanks to the generosity of the University’s Information Technology Service department and individual donors, the Ransom Center has begun acquiring legacy computer equipment to use in accessing these older formats. Recent donations include a Kaypro II, a Victor 9000, related computer manuals, and blank floppy disks. We have used these donations in a few different ways. The first is to facilitate physical access to the legacy media in our collections. Staff members have also used the older computers and disks as visual aids when talking with students, the public, and other interested parties about born-digital archives and preservation. The point of these talks is to educate people about the need for digital preservation. Seeing a Kaypro II, for example, or an 8-inch disk often prompts people to share stories about their early experiences with computer technology, or, if the audience consists of younger students, to ask questions about “ancient” media like 5.25-inch floppy disks. One of the most exciting aspects of digital preservation work has to do with access. How will people who come to our reading room engage with born-digital materials? One possibility is that people will be interested in interacting with a computing environment similar to the one used by a particular author. Loading copies of files from an author’s collection onto a replica of the computer he or she originally used to compose a work would enable a visitor to sit down in front of an Apple ][ Plus, for example, and explore drafts of the stories Denis Johnson wrote using a similar machine. To plan for this and other possibilities, we have begun collecting computers similar to ones used by the authors whose born-digital materials reside in our collection. Even though HIV/AIDS has been influencing American cultural production since the 1980s, only in the last ten years or so has the Ransom Center begun to acquire collections with materials documenting the effects of the pandemic. One recent acquisition that highlights the consequences of the disease on African literature is the Charles R. Larson collection of African and African-American literature. Larson is a professor of literature at American University, as well as a writer and editor. His papers include correspondence and manuscripts by Yvonne Vera (1964–2005), the prolific Zimbabwean novelist and short story writer who died of AIDS in 2005. During her lifetime, she published five novels, a short story collection, and an edited anthology of African women’s writing. 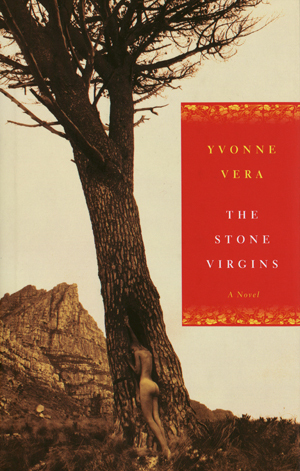 Vera’s novel Under the Tongue (1996) won the 1997 Commonwealth Writers’ Prize (Africa region) for best novel, and her last published novel, The Stone Virgins (2002), won the Macmillan Writer’s Prize for Africa for best unpublished manuscript. She moved back to Zimbabwe in 1995 and served as Director of the National Gallery in Bulawayo from 1997 until 2003. The Larson collection contains important correspondence between Charles Larson and John Jose, Vera’s husband, regarding her life and work. At the time of her death, Vera was working on a novel called Obedience, which remains unpublished. The novel was written before she returned to Canada in 2004, and the fragmented manuscript and deteriorating quality of her writing reflect the AIDS-related cognitive difficulties she was experiencing at the time. The Larson papers contain drafts of the manuscript, as well as notes by Jose about Vera’s planned revisions. Vera’s death and the work she left behind are reminders of the literary cost of the AIDS pandemic in Zimbabwe and southern Africa, in particular, as well as worldwide. Today is World AIDS Day, a day dedicated to raising awareness about HIV and AIDS, remembering the dead, and celebrating the living. The Ransom Center’s collection includes several people, both famous and ordinary, whose lives have been touched by AIDS. Among the most well known is Terrence McNally, whose plays Lisbon Traviata (1985, 1989), Lips Together, Teeth Apart (1991), A Perfect Ganesh (1993), and Love! Valour! Compassion! (1994), as well as the Emmy-winning television movie Andre’s Mother (1988, 1990), incorporate AIDS as part of the social, emotional, and biological fabric of their characters’ lives. All five of these works are represented in the McNally papers at the Ransom Center, in addition to manuscripts, correspondence, and production materials related to his other works, and other materials dating from his high school years through the present. His papers also include 174 computer disks with contents ranging from manuscripts to correspondence to photographs. Digital drafts exist for three of the plays mentioned above: Lips Together, Teeth Apart; A Perfect Ganesh; and Love! Valour! Compassion! Love! Valour! Compassion!, which won a Tony for best play in 1995, is the story of eight gay friends, one of whom owns a large house in the Hudson Valley where the group meets for holiday weekends during one summer. These gatherings become a celebration of friendship and an exploration of life and desire in a time of AIDS. 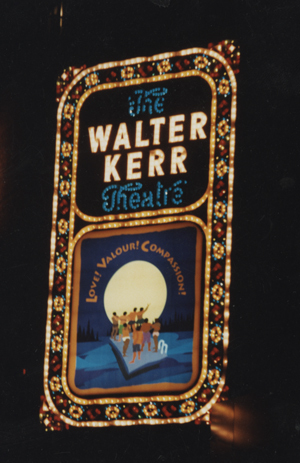 Andre’s Mother first took shape as a short play written for Urban Blight, a musical revue performed at the Manhattan Theater Club in 1988. Both the original eight-minute play and the television movie version, which aired on PBS in 1990 as part of the American Playhouse series, explored the confrontation between Andre’s lover and his mother, and were set at Andre’s memorial service shortly after his death from AIDS. In addition to drafts with McNally’s handwritten corrections, the boxes related to these two works contain a small amount of correspondence from ordinary people who wrote to share their personal experiences with McNally after seeing Andre’s Mother or Love! Valour! Compassion! One letter is from a mother who lost her own son to AIDS. Another is from an older gay man who cared for his long-time partner in his final years. In 1991, Frank Rich wrote in a New York Times review that Lips Together, Teeth Apart, The Lisbon Traviata, and Andre’s Mother “offer unsentimental hope about the possibilities for intimacy at a time when fear and death rule.” McNally’s larger collection and this small pocket of correspondence are a testament to the power of stories, both public and private, to connect people.